Mangaluru, Mar 01, 2017 : The Customs officers at Mangalore International Airport seized contraband valued over Rs.1.16 crores in 24 instances of smuggling during February. The officers seized contraband gold of above 3.18 kgs which were ingeniously concealed and attempted to be smuggled. In three cases primary gold ingeniously concealed in the form of mercury coated wires inside the beading portion and metallic strips of the trolley bags were detected. In another two instances gold concealed in the form of silver coloured paint coated objects of various shapes and sizes viz., beads in chain and bracelets, circular objects in belt buckles, watch strip-holders, buttons of burkha and baby pant were detected. 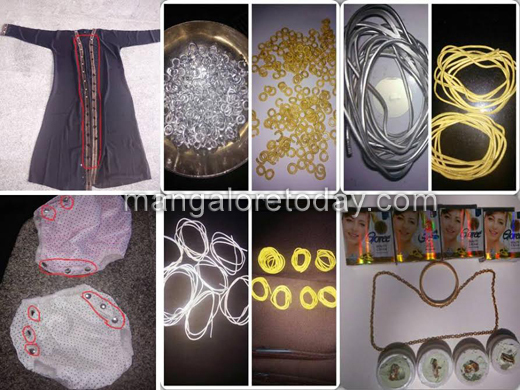 In another two instances crude gold objects in the form of rings and chain were found concealed in face cream and seized besides three gold bars. The value of gold seized in these seven cases is estimated to be over Rs. 92.94 lakhs. One pax was also arrested. Further investigations are under progress. On gathering inputs that there is a surge in smuggling of foreign currency by passengers departing to middle east, the officers kept special watch on movements of certain profiled passengers. This resulted in three seizures of foreign currency attempted to be smuggled out of India equivalent to INR 18.79 lakhs approximately. The cases are under investigation. Smoking tobacco weighing 4.625 kgs valued over Rs. 2.03 lakhs found concealed along with personal effects was seized. Besides, 13 cases of smuggling of assorted foreign brand cigarettes were also detected during the month involving 120 cartons without statutory pictorial warning valued over Rs.2.44 lakhs were also confiscated. The state of the art scanning machines installed by Customs recently are enabling the officers in zeroing on to the right baggage besides aiding in maintaining and further improving facilitation of genuine passengers. Its golden rain last month at MIA .